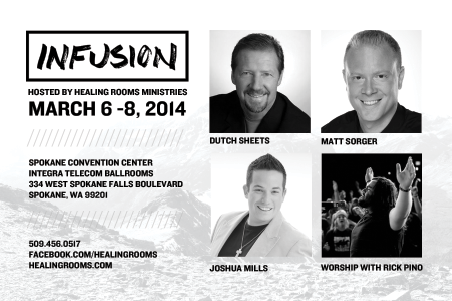 We want to extend an invitation to you for the Infusion Conference, March 6-8, 2014 with Dutch Sheets, Rick Pino, Matt Sorger, Joshua Mills, Jim White and Cal Pierce! 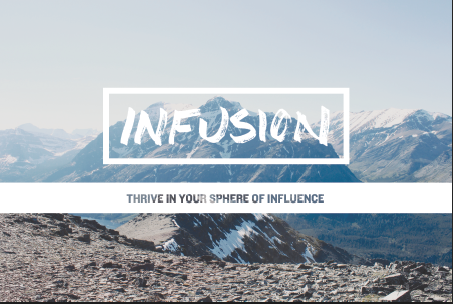 The purpose of Infusion Conference is to release tools and keys which will equip you to thrive in your place of influence. You will have opportunities to receive personal ministry and practical application to demonstrate more of God in your environment. There will also be many times of activation, impartation and a panel with all the guest speakers! Children are also welcome to join as we have a workshop session specifically for them on Friday, March 7th! You can expect to gain new levels of wisdom and strategies during our time together. Please join with us to capture the blueprints specifically designed for your sphere of influence which will ultimately strengthen the vision and add momentum to hosting Heaven and breakthrough in every area of life. Don’t miss this glory-filled time of God’s presence and power! Invite everyone you know. *Families with more than one child please call 509-456-0517 for a discounted rate. The worskshop specifically for children is 2-5 PM on Friday. *please note, if you are looking for suggestions on hotels be sure to connect with us! Thank you so much for joining together with the corporate body of Christ.